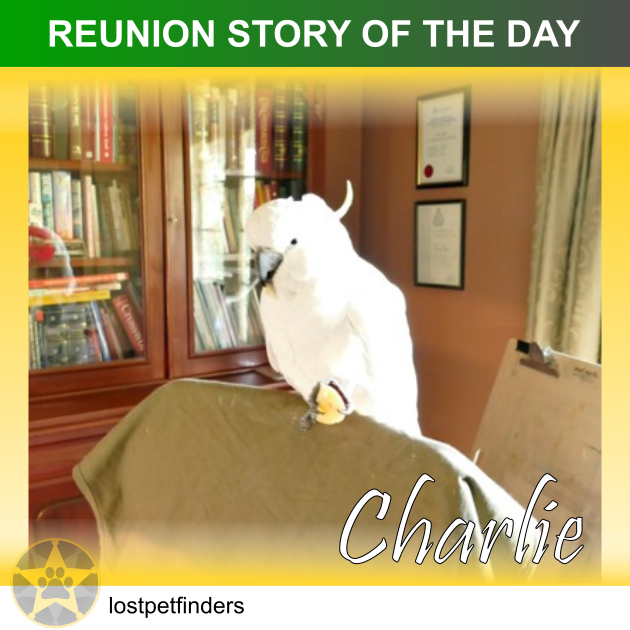 "Charlie came into my house when my daughter brought him home unexpectedly. Oh not another animal to look after! He had the intellect of a two-year-old child and he very quickly became my two year old. About seven weeks ago he had a terrible accident where he pierced his bottom beak on the wire holding a seed bell and he was hanging with the wire protruding from his throat. Thankfully I heard his gut wrenching screams and a pair of pliers were handy so I managed to cut him loose and with help hold him to remove the wire. He recovered well and we have an even stronger bond. Charlie is an escape artist. His wings had been cut but obviously not correctly so he could fly of sorts and on two escapes I was able to coax him down from a tree. He would remove the wire bars from his cage and I found that he could maneuver the cage catch so it was decided to get a sturdy aviary for him...one designed for Macaws and other big birds. I had to go into hospital for a spinal fusion and I was told on the first night that he had flown off again but he was hanging around the place and even had spent time visiting our neighbour’s old Cockatoo about half a kilometre away. As I was the only person he allowed to touch him I knew he would have to wait until I got home from hospital .....certainly making me recover fast from the operation.. I hope you are not going to climb a tree was the discharging nurses concern? I arrived home to be greeted by ‘whatchadooing’ his voice way up high in one of our casuarina trees. 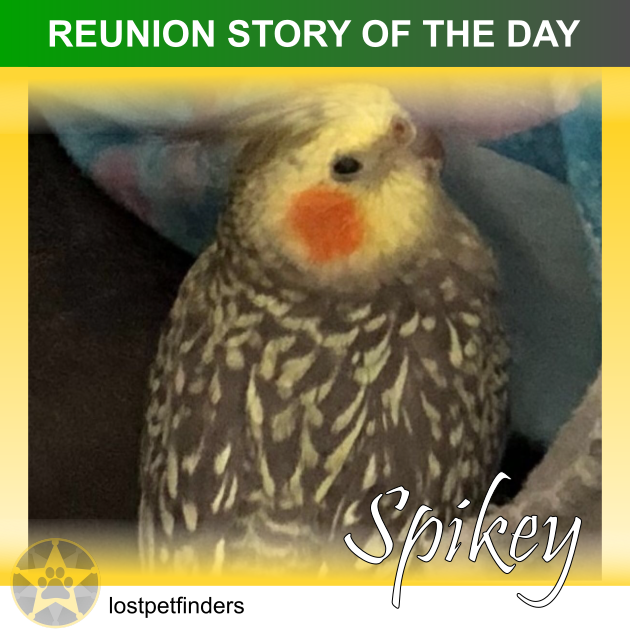 For the following four or five days, he circled our property and our neighbours had to be tolerant as I constantly called to him to ensure he knew where l was and to entice him home with a promise of a big new aviary and I would get him a friend. I was concerned now as he may not be getting enough food and water and he had had to weather a bad storm. The nights were getting colder. It was very disheartening when I could not hear him call back. There were other wild Cockatoos in the area I feared that he had venture away and I had lost him forever. I left a flyer at our local shops and looked to advertise my lost friend on the internet. He had not been heard of for four days day and had been flying around since the 22n April he could be weak and stressed. I found the LPF website quickly and without hesitating, I registered my lost buddy. Within a short time, I had posts stating that there was a found cockatoo advertised and I had a pensive wait until the next morning when I contact the Sydney Veterinary Hospital at Kellyville – they had a cockatoo that someone had handed to them. Was this cockatoo talking so that I could be sure it was him. ‘’No! Kellie said. “He has not said anything however come on in and have a look if it is your cockatoo”. I drove to the veterinary hospital telling myself the odds are fairly good but not to be disappointed if this bird is not Charlie. He was found in a drain, coaxed out and caught before he could fly off again by come cleaver concerned person. I arrived at the hospital wondering how to describe a sulphur crested cockatoo when they are all so similar. I wonder whether he had a scar at the base of his beak and throat that would identify him. claim he was very stand-offish with everyone. The cage was opened and he immediately leaned forward for my kisses and cuddles. Shortly after thanking everyone we were in the car heading home At the back door I heard him say “hello Charlie’. "The first thing I did upon finding the lost dog was to post A4 letters with photo's in the local milk bars. My son also posted the lost dog on facebook. I also then took the dog to the local vet to scan the microchip but unfortunately the owner did not register the microchip with any company, I did not hand the dog into the vet as I did not want the local council ranger to pick up the dog as I did not want to see the dog put down (pit bull cross). Then I explored the internet for dog finding services where I found your wonderful site. Within a few hours I received messages from people who saw the dog on Facebook and then eventually the next day the owner rang and I promptly returned her. 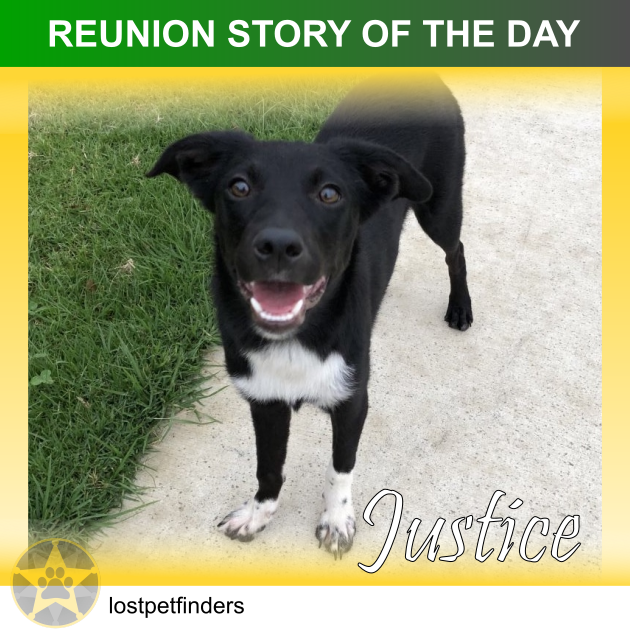 "Justice has been found and is resting after her adventure in her new home, getting used to her new family and surroundings. She is completely unharmed physically, she was even dry apart from this mornings few drops, so she had been keeping dry last night clearly. Her new mum, Melanie, had a call yesterday from a house very close by who got her flyer in the mailbox and recognised Justice from the picture. 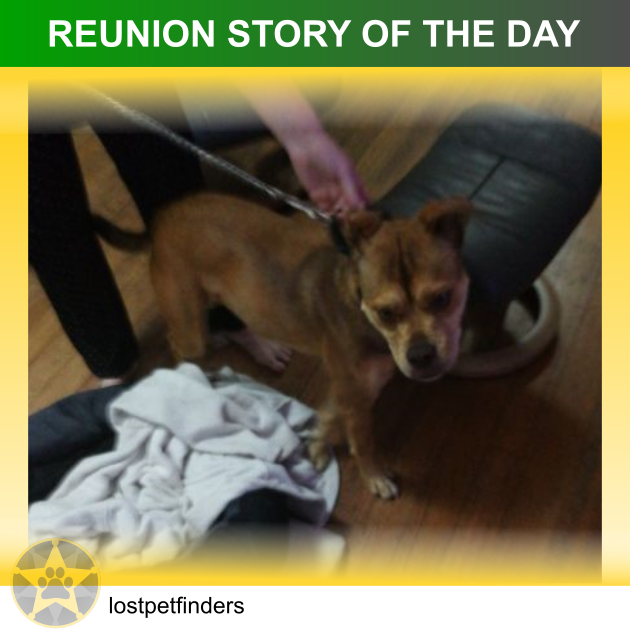 They had seen her the night before in their back yard, about 9:30pm, but she ran away as soon as she saw them. So Melanie called me, I came out to Belgrave straight away, with Pete and Jamie(my dogs), and we walked around everywhere, in the rain, until midnight, calling out, searching backyards, knocking on doors... with no sign. But we had hope because there was a sighting less than 24 hours prior within 200 metres of where she ran off! We had put my jumper and a toy at the front of Melanie’s house, and this morning Melanie’s neighbour called her saying there was a kelpie-looking dog in their front yard, barking, and she should come see if it was Justice. The toy had been taken from the front of the house and dropped 2 houses up where she was hiding in a bush. It was definitely Justice, but she was still too frightened, was barking if anyone approached, and wouldn’t come to anyone even though she was clearly hungry. Melanie called me and I immediately came back up to Belgrave with my dogs... I pulled up to the house and calling out to Justice, let Pete and Jamie out... well! As soon as she saw Pete and Jamie she came out joyfully wagging her tail and jumping and licking, basically beside herself with excitement! She didn’t know who to jump on and kiss first, so she went around doing circles between the 3 of us! I even got lots of kisses and paws in the face. We made the short trip (2 houses away) back to her new home where she’s been eating and sleeping. P&J (the amazing rescue dog search team) and I are hanging around to make her feel comfy in her new home before we leave. We want your pets to live their best life, and that includes working through any of the fears that might be holding us back. Last month, we talked about how you might go about caring for a dog who is afraid of men. It’s commonly assumed that dogs who experience this fear feel this way because they’ve been abused or neglected by a man, but some dogs are just that way by nature. Just like any fear, there’s no one reason that your dog might have it, but there are a good few ways you can work together to deal with it. This is the list we’re slowly working our way through, but it definitely doesn’t cover every fear your dog might have! If there’s another fear or phobia you’d like us to cover to spread information and awareness, please do get in touch. In the meantime, we’re going to look about how you can go about helping your dog to feel more comfortable around strangers. Why is my dog afraid of strangers? Dogs tend to be afraid of strangers for two main reasons. In some cases, it occurs because the dog hasn’t been properly socialised as a puppy. If a pup doesn’t have the opportunity to meet a wide range of different people in their formative years, it’s highly likely they’ll end up being afraid of people they aren’t familiar with. In other cases, your dog’s fear will be all about genetics. Dogs who are timid and skittish often produce offspring who are equally shy. Dogs who are scared of all strangers rather than a specific type of stranger (such as men or children) may experience this because of genetic predisposition. How can I tell when my dog is afraid? Perhaps Rover’s body will be tensing up, his eyes will be darting or he’ll be looking away while making his body as small as possible. Some dogs start sneaking around, furrowing their brows, flattening or perking up their ears or moving much more slowly than usual. Maybe Bowser has started licking her lips, panting for no obvious reason or yawning more than usual. In many cases, the dog’s tail will be held lower than usual, sometimes hidden between the legs. All of these are indicators that your dog is feeling frightened. Make your dog feel safe! If your dog is showing signs of fear and anxiety, you need to help them to calm down. To do this, you need to bring your dog somewhere they can feel safe, and it can be helpful to create a specific safe zone where your dog will always know it is completely safe. Think of it as a puppy panic room! This is a space that is exclusively for your dog, whether that’s a special chair, part of a room or just their crate. Make a rule where nobody except for your dog is allowed to enter the special safety zone. This will allow your dog to see that the area is their special place where nobody is able to hurt or annoy them. Let people know how to greet your dog! If a stranger goes down on one knee by your dog when making their introduction, the meeting is far more likely to be successful. Your dog will feel less threatened as the person is at their level. Often, your dog will be more comfortable with sniffing and accepting pats from a stranger if they aren’t towering over them like a monster (offering a treat can only help the interaction further). It’s also a good idea not to let a stranger make too much eye contact with a dog, as staring can be perceived as intimidating and downright rude. If you don’t know a dog but want to offer a treat, the best way is to drop it on the ground so as not to appear forceful, having first made sure that the owner is alright with you giving their dog a treat. What if the owner is the stranger in question? If you adopt a dog who already has a fear of strangers, it can be pretty difficult to start building a bond between you. However, if you take it easy and allow your dog to move at their own pace, you’ll get there soon enough and the results will be so worth the wait. You’ll need to be very patient and comforting at first so the dog can start to understand that you are not a threat. If your new dog gives you the opportunity to pet them, always do so very calmly. Make sure your voice around your new dog is always soothing, friendly and relaxed, and offer treats by gently throwing them rather than bringing your hand near the dog’s face. Trying to care for a dog who is frightened of strangers can be very difficult, and it’ll take a lot of patience and care on the owner’s part. All the same, if you are considerate and make the decision to always keep your dog safe from surprise encounters with strangers (and especially make a point of avoiding things like markets, dinner parties and parades), the pair of you can get through this.